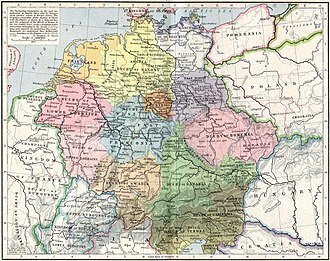 The Electorate of Brunswick-Lüneburg (German: Kurfürstentum Braunschweig-Lüneburg) was an Electorate of the Holy Roman Empire, located in northwestern Germany. It was colloquially known as the Electorate of Hanover (German: Kurfürstentum Hannover or simply German: Kurhannover), after its capital city of Hanover. For most of its existence, the electorate was ruled in personal union with Great Britain. The Duchy of Brunswick-Lüneburg had been split in 1269 between different branches of the House of Welf. The Principality of Calenberg, ruled by a cadet branch of the family, emerged as the largest and most powerful of the Brunswick-Lüneburg states. In 1695, the Holy Roman Emperor elevated the Prince of Calenberg to the College of Electors, creating the new Electorate of Brunswick-Lüneburg. The fortunes of the Electorate were tied to those of Great Britain by the Act of Settlement 1701 and Act of Union 1707, which settled the succession to the British throne on Queen Anne's nearest Protestant relative, the Electress Sophia of Hanover, and her descendants. 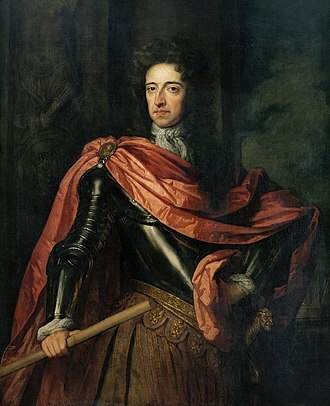 The Prince-Elector of Hanover became King of Great Britain in 1714. As a consequence, a reluctant Britain was forced time and again to defend the King's German possessions. However, Hanover remained a separately ruled territory with its own governmental bodies, and the country had to sign a treaty with Great Britain whenever Hanoverian troops fought on the British side of a war. Merged into the Napoleonic Kingdom of Westphalia in 1807, it was re-established as the Kingdom of Hanover in 1814, and the personal union with the British crown lasted until 1837. 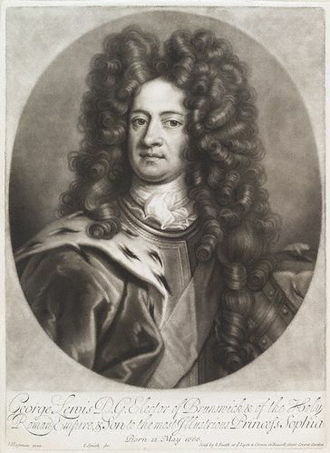 In 1692, Emperor Leopold I elevated Duke Ernest Augustus of the Brunswick-Lüneburg line of Calenberg, to the rank of prince-elector of the Empire as a reward for aid given in the Nine Years' War. There were protests against the addition of a new elector, and the elevation did not become official until the approval of the Imperial Diet in 1708. Calenberg's capital Hanover became colloquially eponymous for the electorate; however, officially it used the name Chur-Braunschweig-Lüneburg of the entire ducal dynasty. The electorate comprised large parts of the modern German state of Lower Saxony in Northern Germany. Beside the Principality of Calenberg it also included the former princely lands of Göttingen and Grubenhagen as well as the territory of the former County of Hoya. In 1705 Elector George I Louis inherited the Principality of Lüneburg with the Duchy of Saxe-Lauenburg upon the death of his uncle Duke George William of Brunswick-Lüneburg. 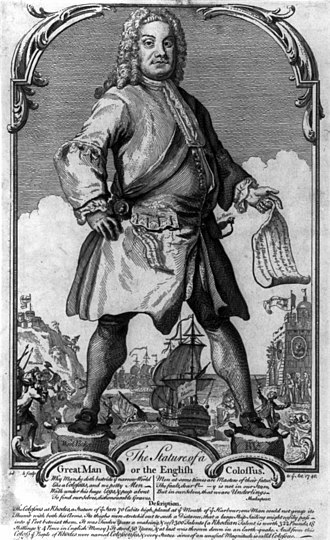 In 1715 he purchased the Duchies of Bremen-Verden from King Frederick IV of Denmark (confirmed by the 1719 Treaty of Stockholm), whereby his former landlocked electorate gained access to the North Sea. In 1700 the territories forming the electorate introduced – like all Protestant territories of imperial immediacy – the Improved Calendar, as it was called by Protestants, in order not to mention the name of Pope Gregory XIII. So Sunday 18 February Old Style was followed by Monday 1 March New Style. 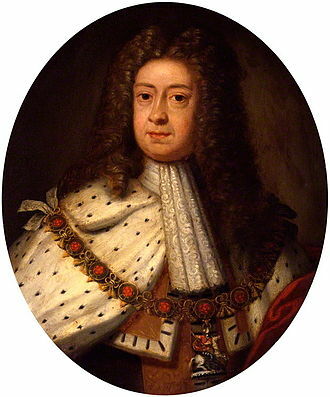 In 1714, George Louis became king of Great Britain, so that the electorate and Great Britain were ruled in personal union. The possessions of the electors in Germany also grew, as they de facto purchased the formerly Swedish-held duchies of Bremen and Verden in 1719. 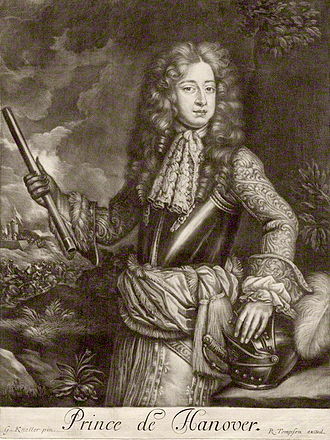 George Louis died in 1727, and was succeeded by his son George II Augustus. 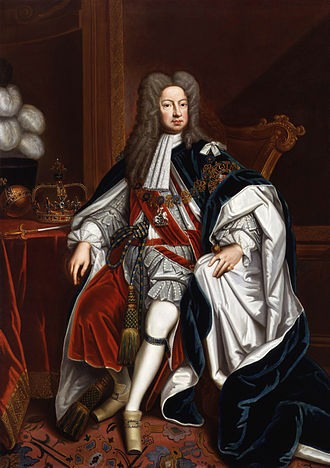 In 1728 Emperor Charles VI officially enfeoffed George II (i.e. gave him land in exchange for a pledge of service), with the reverted fief of Saxe-Lauenburg, which had de facto been ruled in personal union with Hanover and its one[clarification needed] preceding Principality of Lüneburg since 1689. In 1731 Hanover also gained Hadeln. In return, Hanover recognized the Pragmatic Sanction of 1713 which changed Habsburg inheritance law. It took George II Augustus until 1733 to persuade Charles VI to enfeoff him also with the Duchy of Bremen and the Principality of Verden, colloquially called Duchies of Bremen-Verden. At both enfeoffments George II Augustus swore that he would respect the existing privileges and constitutions of the estates in Bremen-Verden and in Hadeln, thus confirming 400-year-old traditions of estate participation in government. In Hanover, the capital of the Electorate, the Privy Council of Hanover (electoral government) installed a new ministry in charge of the Imperial Estates ruled by the Electors in personal union. It was called the Department of Bremen-Verden, Hadeln, Lauenburg and Bentheim. However the Electors spent most of their time in England. Direct contact with the Electorate was maintained through the office of the German Chancery, situated in St James's Palace in London. During the Anglo-French and Indian War (1754–63) in the North American colonies, Britain feared a French invasion in Hanover. 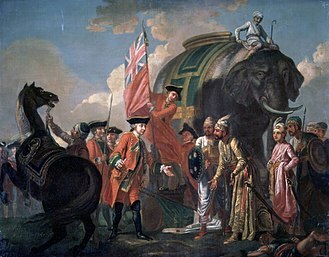 George II formed an alliance with his Brandenburg-Prussian cousin Frederick II, "the Great" combining the North American conflict with the Brandenburg-Prusso–Austrian Third Silesian or Seven Years' War (1756–63). In summer 1757 the French invaded Hanover and defeated George II's son Prince William, Duke of Cumberland, leading the Anglo-Hanoverian army, at the Battle of Hastenbeck and drove him and his army into remote Bremen-Verden, where in the former Zeven Convent [de] he capitulated on 18 September (Convention of Kloster-Zeven). But George II did not recognise the convention. 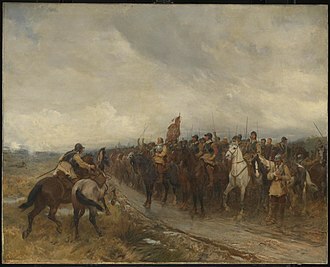 In the following year the British army, supported by troops from Brandenburg-Prussia, Hesse-Kassel and the ducal Principality of Brunswick and Lunenburg (Wolfenbüttel) again expelled the occupants. 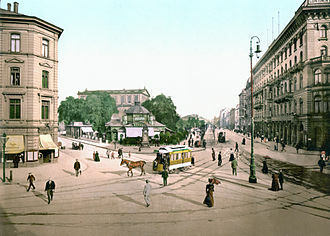 Hanover remained unaffected for the rest of the war. After the war ended, peace prevailed until the French Revolutionary Wars started. The War of the First Coalition against France (1793–97) with Great Britain-Hanover and other war allies forming the coalition, did not affect Hanoverian territory, since the first French Republic was fighting on several fronts, even on its own territory. However, men were drafted to recruit the 16,000 Hanoverian soldiers fighting in the Low Countries under British command against France. 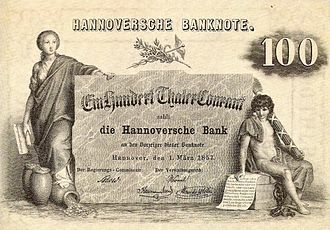 In 1795 the Holy Roman Empire declared its neutrality, including Hanover; however, a peace treaty with France was under negotiation until it failed in 1799. Brandenburg-Prussia, however, ended for its part the war with France by the Treaty of Basel (1795), stipulating that Brandenburg-Prussia would ensure the Holy Roman Empire's neutrality in all the latter's territories north of the demarcation line of the river Main, including the British continental dominions of Hanover, Bremen-Verden, and Saxe-Lauenburg. 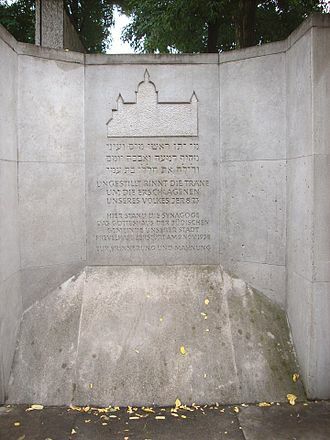 To this end Hanover also had to provide troops for the so-called demarcation army maintaining the armed neutrality. During the War of the Second Coalition against France (1799–1802) Napoléon Bonaparte urged Brandenburg-Prussia to occupy the continental British dominions. In 1801 24,000 Brandenburg-Prussian soldiers invaded, surprising Hanover, which surrendered without a fight. 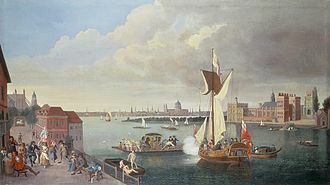 In April 1801 the Brandenburg-Prussian troops arrived in Bremen-Verden's capital, Stade, and stayed there until October that year. The British first ignored Brandenburg-Prussia's hostility, but when the latter joined the pro-French coalition of armed neutral powers including Denmark-Norway and Russia, Britain began to capture Brandenburg-Prussian ships. After the Battle of Copenhagen (1801) the coalition fell apart and Brandenburg-Prussia withdrew its troops. As part of the German Mediatisation of 25 February 1803, the Electorate received the Prince-Bishopric of Osnabrück in real union, whose every second ruler had been alternately members of the House of Hanover since 1662. After Britain – this time without any allies – had declared war on France (18 May 1803), French troops invaded Hanover on 26 May. According to the Convention of Artlenburg (5 July 1803), confirming the military defeat of Hanover, the Hanoverian army was disarmed and its horses and ammunitions were handed over to the French. The Privy Council of Hanover, with minister Friedrich Franz Dieterich von Bremer holding up the Hanoverian stake[clarification needed], fled to Saxe-Lauenburg across the Elbe, ruled by Britain-Hanover in personal union. Soon afterwards the French also occupied Saxe-Lauenburg. In autumn 1805, at the beginning of the War of the Third Coalition against France (1805–6), the French occupying troops left Hanover in a campaign against Austria. British, Swedish and Russian coalition forces captured Hanover. In December the Empire of the French, since 1804 France's new government, ceded Hanover, which it did not hold any more, to Brandenburg-Prussia, which captured it early in 1806. On 6 August 1806 the Holy Roman Empire was dissolved, thereby abolishing the function of prince-electors electing its emperors. Thus the title of Elector of Brandenburg became meaningless for the Kingdom of Prussia. After it had turned against France, it was defeated in the Battle of Jena-Auerstedt (11 November 1806), and France recaptured Hanover. Following the Treaty of Tilsit in 1807 the new Kingdom of Westphalia was founded, ruled by Napoléon's brother Jérôme Bonaparte, then including territories of the former Electorate of Hesse-Cassel, the ducal Brunswick-Lüneburgian principality Brunswick-Wolfenbüttel, and formerly Prussian territories. 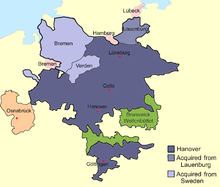 In early 1810 Hanover proper and Bremen-Verden, but not Saxe-Lauenburg, were also annexed by Westphalia. In an attempt to assert the Continental System, the French Empire annexed in late 1810 all the continental North Sea coast (as far as Denmark) and the areas along the sections of the rivers navigable for seagoing vessels, including Bremen-Verden and Saxe-Lauenburg and some adjacent territories of Hanover proper. However, the government of George III did not recognise the French annexation, being at war continuously with France through the entire period, and Hanoverian ministers continued to operate out of London. The Privy Council of Hanover maintained its own separate diplomatic service, which maintained links with countries such as Austria and Prussia, with whom the United Kingdom itself was technically at war. The Hanoverian army was dissolved, but many of the officers and soldiers went to England, where they formed the King's German Legion. The Legion was the only German army to fight continually all through the Napoleonic wars against the French. French control lasted until October 1813, when the territory was overrun by Russian troops, and the Battle of the Nations at Leipzig later the same month spelled the definitive end to the Napoleonic client state of Westphalia, as well as the entire Confederation of the Rhine, after which the rule of the House of Hanover was restored. The former electorate became the Kingdom of Hanover, confirmed at the Congress of Vienna in 1814. The Electorate was legally indivisible: it could add to its territory, but not alienate territory or be split up among several heirs – as used to be the rule before, having led at times to a multitude of Brunswick-Lüneburgian principalities. Its succession was to follow male primogeniture. Since this was against the Salic law, then valid for the ducal family, the change needed imperial confirmation, which Emperor Leopold I granted in 1692. In 1692, at its upgrading to the rank of electorate, its territory comprised the Brunswick-Lüneburgian principalities of Calenberg and Grubenhagen, which the line of the former[clarification needed] had already inherited in 1665. But before the confirmation of the electorate by the Imperial Diet in 1708 the Calenberg line further inherited the principality of Celle in 1705. Further included were the earlier acquired counties of Diepholz and Hoya. Although the Holy Roman Empire was dissolved in 1806, George III's government did not consider the dissolution to be final, and he continued to be styled "Duke of Brunswick-Luneburg, Arch-treasurer and Prince-Elector of the Holy Roman Empire" until 1814. Georg Ludwig 1708–1727 Son of Ernest Augustus. 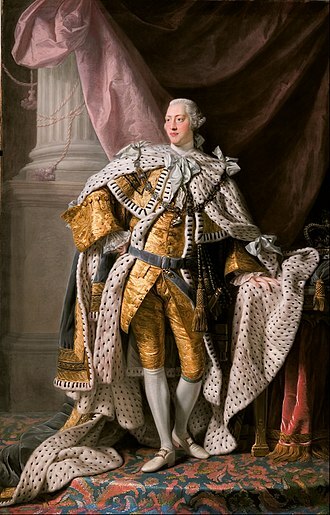 Became King of Great Britain and Ireland in 1714. Acquired Bremen-Verden in 1719. Georg II. 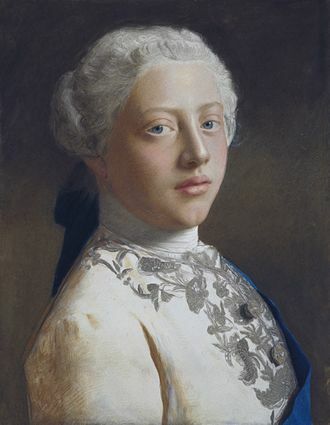 August 1727–1760 Son of George I. Acquired the Land of Hadeln in 1731. Georg III. Wilhelm Friedrich 1760–1806 Grandson of George II. Became King of the United Kingdom (by the Act of Union with Ireland) in 1801. Acquired the Prince-Bishopric of Osnabrück in 1803. He lost (early 1801), regained (April 1801), lost again (May 1803), regained again (Autumn 1805), lost for a third time (early 1806), and regained for a third time (October 1813) de facto power in Hanover by various occupations and annexations during the Great French War (1801–1813). Although the Electoral title became defunct with the dissolution of the Holy Roman Empire in 1806, George III did not recognise this dissolution, and retained the Electoral title until early 1814, when he was proclaimed King of Hanover, a title which was universally recognised during the Congress of Vienna (1814–15). ^ During the 18th. century, whenever war was declared between Great Britain and France, the French army invaded or threatened to invade Hanover, forcing Great Britain to intervene diplomatically and militarily to defend the Electorate. In 1806, George III of the United Kingdom even declared war on Prussia after King Frederick William III, under heavy pressure from Napoleon, had annexed George III's German possessions. Auguste Himly, Histoire de la formation territoriale des États de l'Europe centrale. 1876, vol. 1, pp. 95–96. ^ a b Wilson 2016, p. 583. Wilson, Peter H. (2016). Heart of Europe: A History of the Holy Roman Empire. Harvard University Press. ISBN 978-0674058095. 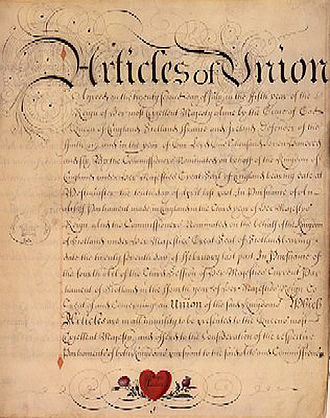 The Acts of Union were two Acts of Parliament, the Union with Scotland Act 1706 passed by the Parliament of England, and the Union with England Act passed in 1707 by the Parliament of Scotland. They put into effect the terms of the Treaty of Union that had agreed on 22 July 1706. Although described as a Union of Crowns, until 1707 there were in two separate Crowns resting on the same head. The Acts took effect on 1 May 1707, on this date, the Scottish Parliament and the English Parliament united to form the Parliament of Great Britain, based in the Palace of Westminster in London, the home of the English Parliament. Hence, the Acts are referred to as the Union of the Parliaments, on the Union, the historian Simon Schama said What began as a hostile merger, would end in a full partnership in the most powerful going concern in the world. It was one of the most astonishing transformations in European history, the first attempts at Union surrounded the foreseen unification of the Royal lines of Scotland and England. In pursuing the English throne in the 1560s, Queen of Scots pledged herself to a union between the two kingdoms. England and Scotland were ruled by the king for the first time in 1603 when James VI of Scotland became the king of England. However they remained two separate states until 1 May 1707, the first attempt to unite the parliaments of England and Scotland was by Marys son, King James VI and I. On his accession to the English throne in 1603 King James announced his intention to unite his two realms so that he would not be guilty of bigamy. James used his prerogative powers to take the style of King of Great Britain and to give an explicitly British character to his court. In the meantime, James declared that Great Britain be viewed as presently united, and as one realm and kingdom, the Scottish and English parliaments established a commission to negotiate a union, formulating an instrument of union between the two countries. However, the idea of union was unpopular, and when James dropped his policy of a speedy union. Prince of the Holy Roman Empire was a title attributed to a hereditary ruler, nobleman or prelate recognised as such by the Holy Roman Emperor. Originally, possessors of the title bore it as immediate vassals of the Empire, secular or ecclesiastical. However, by the time the Holy Roman Empire was abolished in 1806, the first came to be reckoned as royalty in the sense of being treated as sovereigns, entitled to inter-marry with reigning dynasties. The second tier consisted of high-ranking nobles whose princely title did not, the actual titles used by Imperial princes varied considerably for historical reasons, and included archdukes, margraves, counts palatine, princely counts, as well as princes. The estate of princes or Reichsfürstenstand was first established in a legal sense in the Late Middle Ages. Not all states met all three requirements, so one may distinguish between effective and honorary princes of the Holy Roman Empire, from the 13th century onwards, further estates were formally raised to the princely status by the emperor. 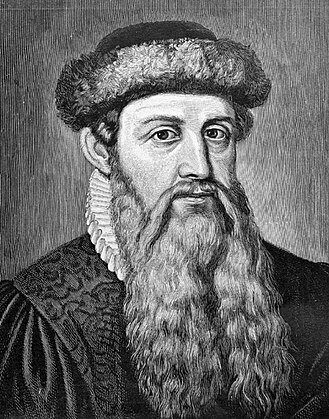 The resolutions of the Diet of Augsburg in 1582 explicitly stated that the status was linked with the possession of a particular Imperial territory. Most of the Counts who ruled territories were raised to Princely rank in the decades before the end of the Empire in 1806, ecclesiastical Princes were the Prince-Bishops as well as the actual Prince-abbots. They comprised a number of entities which were secularized and mediatized after the 1648 Peace of Westphalia. The honorary status of prince of the Holy Roman Empire might be granted to certain individuals, sovereigns outside the Empire, such as the Sovereign Military Order of Malta. The Prince of Piombino was another example, nobles allowed to bear the princely title, but who had neither a vote nor a seat in the Imperial Diet, individual or shared, such as the House of Kinsky. This included nobles who lacked immediacy, but who were allowed, motu proprio, by the Emperor to enjoy the title, although this courtesy tended to become hereditary for families, the right to princely status was called Personalist and could be revoked by the Emperor. 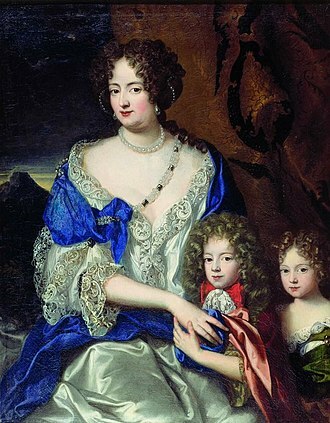 Sophia of the Palatinate was the Electress of Hanover from 1692 to 1698. As a granddaughter of James VI and I, she became heir presumptive to the crowns of the Kingdom of England, after the Act of Union,1707, she became heir presumptive to the unified throne of the Kingdom of Great Britain. She died less than two months before she would have become queen, and her claim to the throne passed on to her eldest son, George Louis, Elector of Hanover, Sophias brother Charles Louis was restored to the Palatinate as part of the Peace of Westphalia. Sophia married Ernest Augustus of Brunswick-Lüneburg in 1658, despite his jealous temper and frequent absences, Sophia loved him, and bore him seven children who survived to adulthood. Initially a landless cadet, Ernest Augustus succeeded in having the House of Hanover raised to electoral dignity in 1692, Sophia became Electress of Hanover, the title by which she is best remembered. A patron of the arts, Sophia commissioned the palace and gardens of Herrenhausen and sponsored philosophers, such as Gottfried Leibniz, through her mother, she was the granddaughter of James VI and I, king of Scotland and England. At birth, Sophia was granted an annuity of 40 thalers by the Estates of Friesland. Sophia was courted by her first cousin, Charles II of England, before her marriage, Sophia, as the daughter of Frederick V, Elector Palatine of the Rhine, was referred to as Sophie, Princess Palatine of the Rhine, or as Sophia of the Palatinate. The Electors of the Palatinate were the Calvinist senior branch of House of Wittelsbach, on 30 September 1658, she married Ernest Augustus, Elector of Brunswick-Lüneburg, at Heidelberg, who in 1692 became the first Elector of Hanover. Ernst August was a cousin of Sophias mother Elizabeth Stuart. Sophia became a friend and admirer of Gottfried Leibniz while he was librarian at the Court of Hanover and their friendship lasted from 1676 until her death in 1714. This friendship resulted in a correspondence, first published in the nineteenth century. She was well-read in the works of René Descartes and Baruch Spinoza, together with Ernest Augustus, she greatly improved the Summer Palace of Herrenhausen and she was the guiding spirit in the creation of the gardens surrounding the palace, where she died. The prince-electors of the Holy Roman Empire were the members of the electoral college of the Holy Roman Empire. From the 13th century onwards, the Prince-Electors had the privilege of electing the King of the Romans, Charles V was the last to be a crowned Emperor, his successors were elected Emperors directly by the electoral college, each being titled Elected Emperor of the Romans. In practice, all but one Emperor from 1440 onwards came from the Austrian House of Habsburg, the dignity of Elector carried great prestige and was considered to be second only to that of King or Emperor. The Electors had exclusive privileges that were not shared with the princes of the Empire. The heir apparent to a secular prince-elector was known as an electoral prince, the German practice of electing monarchs began when ancient Germanic tribes formed ad hoc coalitions and elected the leaders thereof. Elections were irregularly held by the Franks, whose successor states include France, the French monarchy eventually became hereditary, but the Holy Roman Emperors remained elective, at least in theory, although the Habsburgs provided most of the monarchs. While all free men originally exercised the right to vote in such elections, in the election of Lothar II in 1125, a small number of eminent nobles chose the monarch and submitted him to the remaining magnates for their approbation. Soon, the right to choose the monarch was settled on a group of princes. The college of electors was mentioned in 1152 and again in 1198, a letter of Pope Urban IV suggests that by immemorial custom, seven princes had the right to elect the King and future Emperor. The seven have been mentioned as the vote-casters in the election of 1257 that resulted in two kings becoming elected, the Count Palatine of the Rhine held most of the former Duchy of Franconia after the last Duke died in 1039. The Margrave of Brandenburg became an Elector when the Duchy of Swabia was dissolved after the last Duke of Swabia was beheaded in 1268, even with diminished territory, retained its eminent position. The Palatinate and Bavaria were originally held by the same individual, the King of Bohemia, who held the ancient imperial office of Arch-Cupbearer, asserted his right to participate in elections. At the end of the Napoleonic Wars, the Electorate was enlarged to become a Kingdom with Hanover as its capital. From 1868 to 1946 Hanover was the capital of the Prussian Province of Hanover and it is now the capital of the Land of Lower Saxony. Since 2001 it has been part of the Hanover district, which is a body made up from the former district. 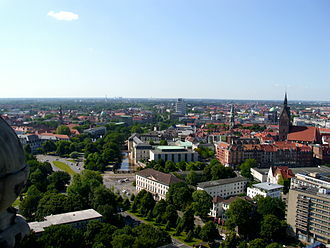 With a population of 518,000, Hanover is a centre of Northern Germany. Hanover hosts annual commercial trade fairs such as the Hanover Fair, every year Hanover hosts the Schützenfest Hannover, the worlds largest marksmens festival, and the Oktoberfest Hannover, the second largest such festival in Germany. 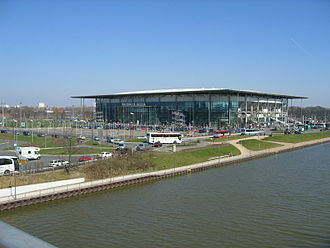 In 2000, Hanover hosted the world fair Expo 2000, the Hanover fairground, due to numerous extensions, especially for the Expo 2000, is the largest in the world. Hanover is of importance because of its universities and medical school, its international airport. The city is a crossing point of railway lines and highways. Hanover is the traditional English spelling, the German spelling is becoming more popular in English, recent editions of encyclopaedias prefer the German spelling, and the local government uses the German spelling on English websites. The traditional English spelling is used in historical contexts, especially when referring to the British House of Hanover. Hanover was founded in times on the east bank of the River Leine. Its original name Honovere may mean high bank, though this is debated, Hanover was a small village of ferrymen and fishermen that became a comparatively large town in the 13th century due to its position at a natural crossroads. As overland travel was difficult, its position on the upper navigable reaches of the river helped it to grow by increasing trade. In the 14th century the churches of Hanover were built. The beginning of industrialization in Germany led to trade in iron and silver from the northern Harz Mountains, in 1636 George, Duke of Brunswick-Lüneburg, ruler of the Brunswick-Lüneburg principality of Calenberg, moved his residence to Hanover. The Dukes of Brunswick-Lüneburg were elevated by the Holy Roman Emperor to the rank of Prince-Elector in 1692, thus the principality was upgraded to the Electorate of Brunswick-Lüneburg, colloquially known as the Electorate of Hanover after Calenbergs capital. Her mother, Princess Elizabeth Stuart, had been born in Scotland but became famous in history as Elizabeth of Bohemia. The line of Sophia of Hanover was the most junior among the Stuarts, Sophia died on 8 June 1714, before the death of Queen Anne on 1 August 1714, at which time Sophias son duly became King George I and started the Hanoverian dynasty. 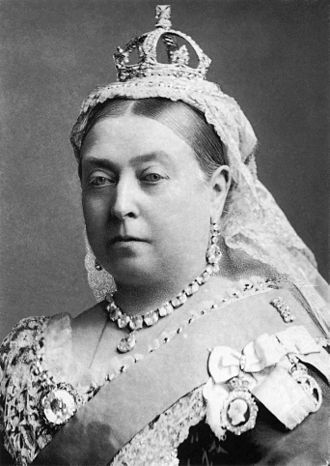 The act played a key role in the formation of the Kingdom of Great Britain and Scotland had shared a monarch since 1603, but had remained separately governed countries. The Scottish parliament was more reluctant than the English to abandon the House of Stuart, English pressure on Scotland to accept the Act of Settlement was one factor leading to the parliamentary union of the two countries in 1707. Under the Act of Settlement anyone who became a Roman Catholic, or who married one, the act placed limits on both the role of foreigners in the British government and the power of the monarch with respect to the Parliament of England. Some of those provisions have been altered by subsequent legislation, the original documents are deposited in the Lower Saxon State Archives in Hanover, Germany. During the debate, the House of Lords had attempted to append Sophia and her descendants to the line of succession, mary II died childless in 1694, after which William III did not remarry. In 1700, Prince William, Duke of Gloucester, who was the child of Princess Anne to survive infancy. Thus, Anne was left as the last remaining heir to the throne. 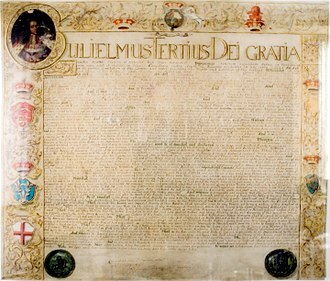 The Bill of Rights excluded Catholics from the throne, which ruled out James II, however, it provided for no further succession after Anne. Parliament thus saw the need to settle the succession on Sophia and her descendants, is are or shall be reconciled to or shall hold Communion with the See or Church of Rome or shall profess the Popish Religion or shall marry a Papist. Thus, those who were Roman Catholics, and those who married Roman Catholics, were barred from ascending the throne. Eight additional provisions of the act would only come into effect upon the death of both William and Anne, The monarch shall join in communion with the Church of England and this was intended to ensure the exclusion of a Roman Catholic monarch. The Imperial Diet was the deliberative and legislative body of the Holy Roman Empire. Its members were the Imperial Estates, divided into three colleges, the diet as a permanent, regularized institution evolved from the Hoftage of the Middle Ages. From 1663 until the end of the empire in 1806, it was in permanent session at Regensburg, the Imperial Estates had, according to feudal law, no authority above them besides the Holy Roman Emperor himself. The holding of an Imperial Estate entitled one to a vote in the diet, thus, an individual member might have multiple votes and votes in different colleges. In general, members did not attend the permanent diet at Regensburg, the late imperial diet was in effect a permanent meeting of ambassadors between the Estates. Initially, there was neither a fixed time nor location for the Diet, the Golden Bull of 1356 cemented the concept of territorial rule, the largely independent rule of the dukes over their respective territories, and limited the number of electors to seven. The Pope, contrary to myth, was never involved in the electoral process. However, until the late 15th century, the Diet was not actually formalized as an institution, the dukes and other princes would irregularly convene at the court of the Emperor, these assemblies were usually referred to as Hoftage. Only beginning in 1489 was the Diet called the Reichstag, the two colleges were that of the prince-electors and that of the other dukes and princes. Several attempts to reform the Empire and end its slow disintegration, notably starting with the Diet of 1495, from to its end in 1806, the Empire was not much more than a collection of largely independent states. Only with the introduction of the Perpetual Diet of Regensburg in 1663 did the Diet permanently convene in a fixed location. The Imperial Diet of Constance opened on 27 April 1507, it recognized the unity of the Holy Roman Empire and founded the Imperial Chamber, the empire’s supreme court. Since 1489, the Diet comprised three colleges, The Electoral college, led by the Prince-Archbishop of Mainz in his capacity as Archchancellor of Germany, in 1692 the Elector of Brunswick-Lüneburg became the ninth Prince-elector as Archbannerbearer during the Nine Years War. Sophia as dowager Electress of Hanover, around the time she was proclaimed heir presumptive of the British crown. Prince-Bishopric of Osnabrück in 1786 (red line). Seating plan for an inauguration of the Imperial Diet in the Regensburg Town Hall from a 1675 engraving: Emperor and Prince-electors at the head, secular Princes to the left, ecclesiastical to the right, deputies of Imperial Cities in the foreground. The Otterndorf Sluice and its pumping station. Right: the "diesel" pumphouse (nowadays also driven by an electric engine), left: the electric pumphouse. Land flooded by a 'small' storm surge of only 4.50 m when a dyke broke at Glameyer Stack, Otterndorf.